These Homemade Marshmallows just so happen to be in the shape of an egg. Perfect for Easter celebrations! 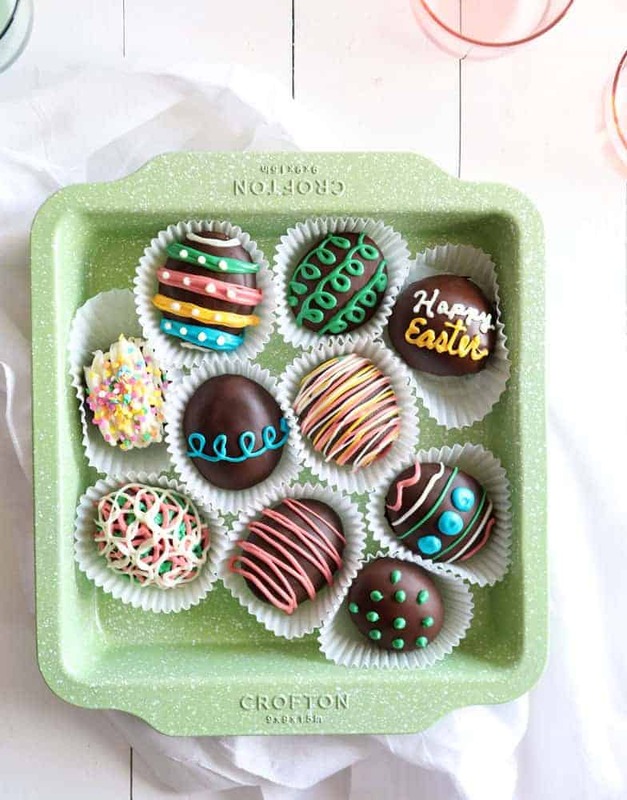 You can decorate these marshmallow eggs in so many creative and delicious ways! Making marshmallows at home can seem intimidating, but it really is a simple process. I use 5 ingredients to make these Easter-inspired marshmallows; water, gelatin, sugar, corn syrup, and chocolate. Having the right tools can help though! Using a stand mixer is important when making marshmallows at home as they need to mix on high for about 10 minutes. I found that my hand-held mixer wasn’t strong enough to power through sticky marshmallow for that long. The overall process takes a few hours, but it is definitely one that can incorporate the whole family. Especially the kids! 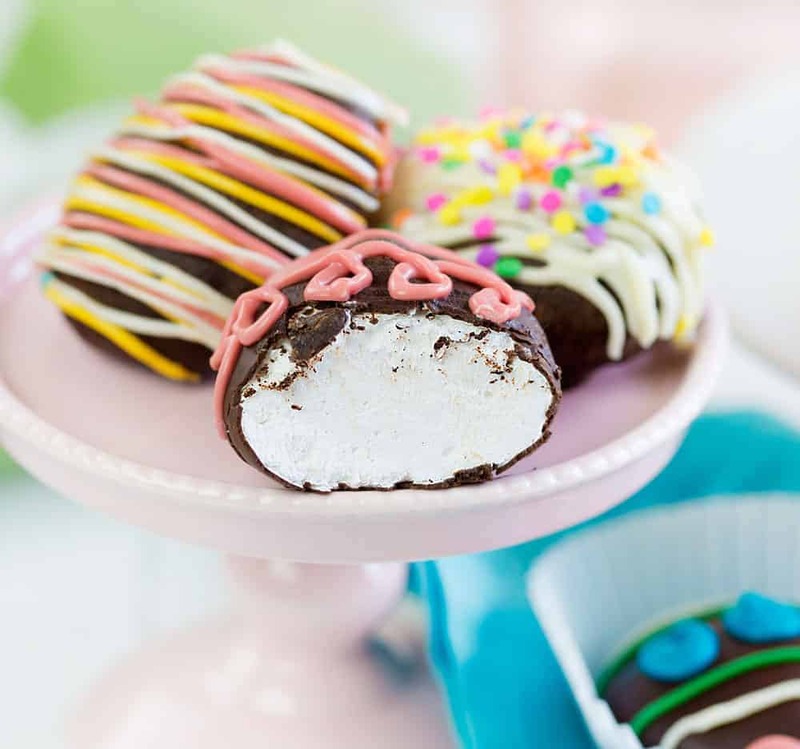 Who doesn’t love decorating chocolate covered marshmallows in fun springtime colors? I took inspiration from Taste of Home and decided to make my own egg-shaped molds for this recipe. They used flour, but I found that working with confectioner’s sugar was much better! I poured 32 ounces of confectioner’s into my new pan from ALDI. Flatten it out with a large offset spatula or ruler. Next, take a clean egg and gently press it into the confectioner’s sugar. Place each egg indentation about 2-inches apart. You may need to dust your egg off as you go. If you happen to have a mini confectioners sugar avalanche in your mold, simply press the egg back into the indentation. The second time I made this I actually made up 2 pans of molds which was about perfect in terms of how much marshmallow volume you have. Set the egg molds aside and begin making the marshmallow. Add water and gelatin to your stand mixer. 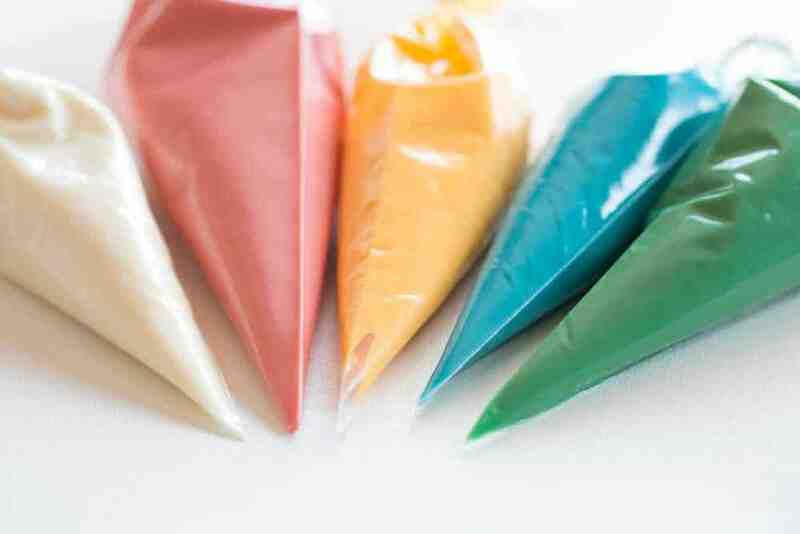 The gelatin will soften while you are preparing the sugar mixture. On your stovetop, fill a pan with water, sugar, and corn syrup. Stir it over medium heat until the sugar dissolves. Now add a candy thermometer and stop stirring. Allow the sugar mixture to bubble and boil until it reaches 240°F. Once it has, remove the sugar mixture from the heat and carefully pour into your stand mixer fitted with the whisk attachment. Turn mixer on high and whisk for about 10 minutes or until the marshmallow is at least tripled in volume and is shiny. While the marshmallow is whisking, prepare your pastry bags. I was able to fill 4 bags with the marshmallow. I placed an individual bag on a kitchen glass and pressed it firmly into the glass. When the marshmallow is done you will want to move quickly to transfer it to your pastry bags. I used an offset spatula and pressed some of the mixture into a bag, set the mixing bowl down, then used my spatula to press the marshmallow as far into the bag as possible. Close with a rubber band or twist tie and move on to the next bag. When you are ready to pipe the marshmallows make sure you have your pan with the egg molds, the piping bags, and a clean kitchen scissors. I sprayed my scissors with baking spray repeatedly to make sure they would not stick to the marshmallow. Start by cutting off the tip of your first bag of marshmallow and then pipe it into one of the egg indentations. You can start in the middle and let it fill or start on one of the ends and move in the opposite direction. When you are done filling the indentation hold your bag steady and then cut off the marshmallow with your scissors. If your marshmallow moves in the egg indentation at all, dab your finger in the confectioner’s sugar and move it back. After you have filled your tray, dip your fingers in the confectioner’s sugar and press down on each marshmallow egg. You want the bottom to be as flat as possible. Allow the marshmallow eggs to set for at least a couple hours or up to overnight. If you are planning on making this over the course of a couple days, this is the best place to stop. 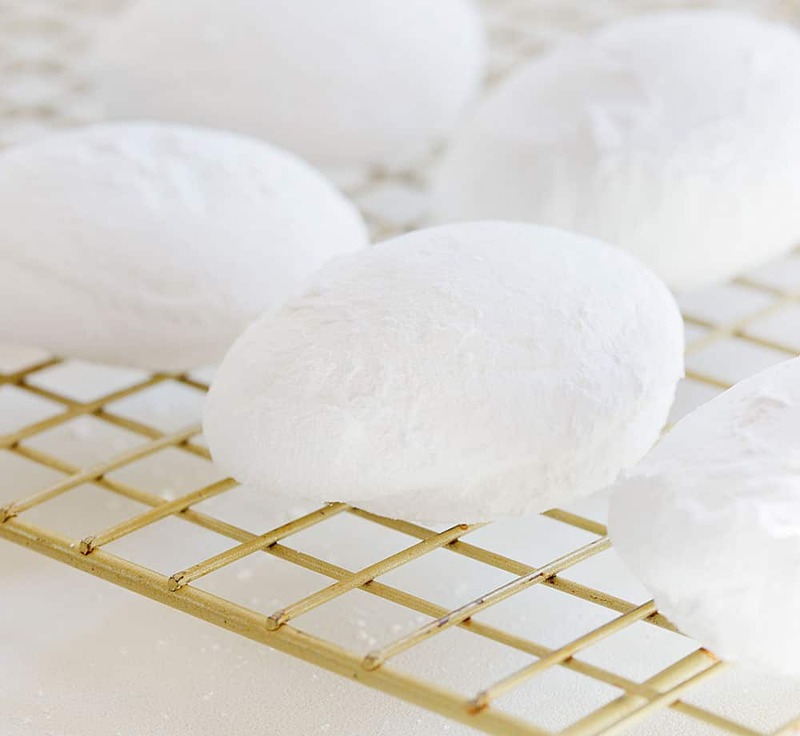 Once your marshmallows are set, pick each one up and dust off as much confectioners sugar as you can then place on a cooling rack or parchment lined baking sheet. Now prepare your chocolate. You will want anywhere from 8-12 ounces of chocolate and can choose what flavor you prefer. After making this recipe several times, we decided that a darker chocolate works best to counteract the sweetness of the marshmallow. 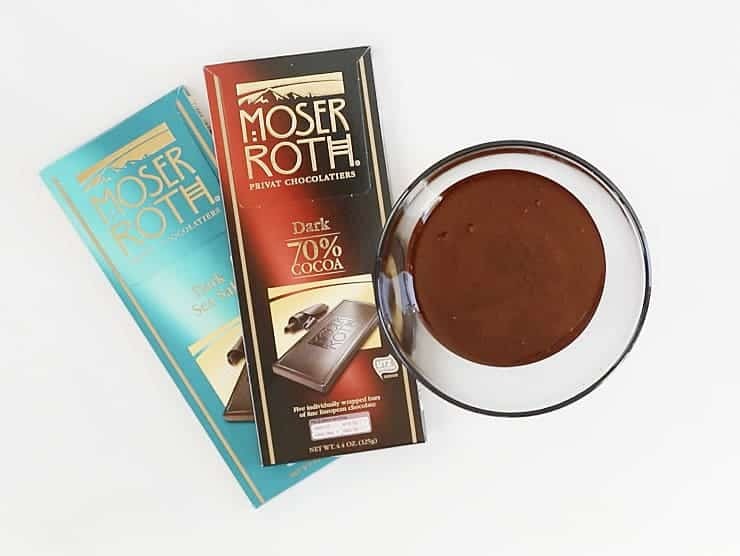 I also tried the Dark Sea Salt chocolate from Moser Roth and LOVED IT. Dip each marshmallow into the melted chocolate and make sure it is completely covered. Using a fork, move the marshmallow to a parchment lined baking sheet and allow the chocolate to set, or harden, for a couple hours. If you need to move quickly you can also place them in the refrigerator, but I do not recommend placing them in the freezer. 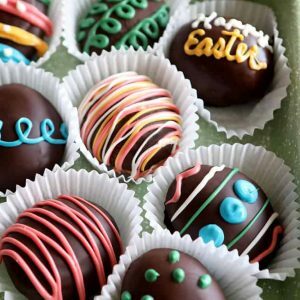 When you are ready to decorate, prepare your colorful chocolate. I used candy melts in green, pink, yellow, white, and blue. I melted about 1/4 cup of melts directly in a pastry bag. Heat the chocolate melts for about 1 minute then massage the melts around to make sure they are melting evenly. You can place the bag back into the microwave in 15-second increments making sure to massage between each heating. 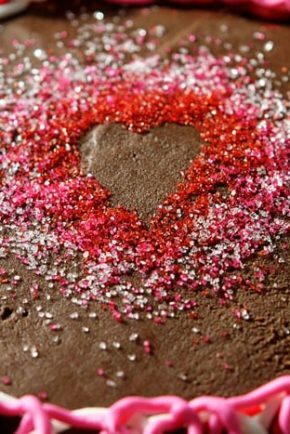 As the chocolate melts will harden at room temperature, it is best to work quickly when you are decorating. You may need to stop and reheat them for a few seconds. Have fun with your piping! You can create lines, zig-zags, swirls, even pipe out words or phrases. The sky is the limit! 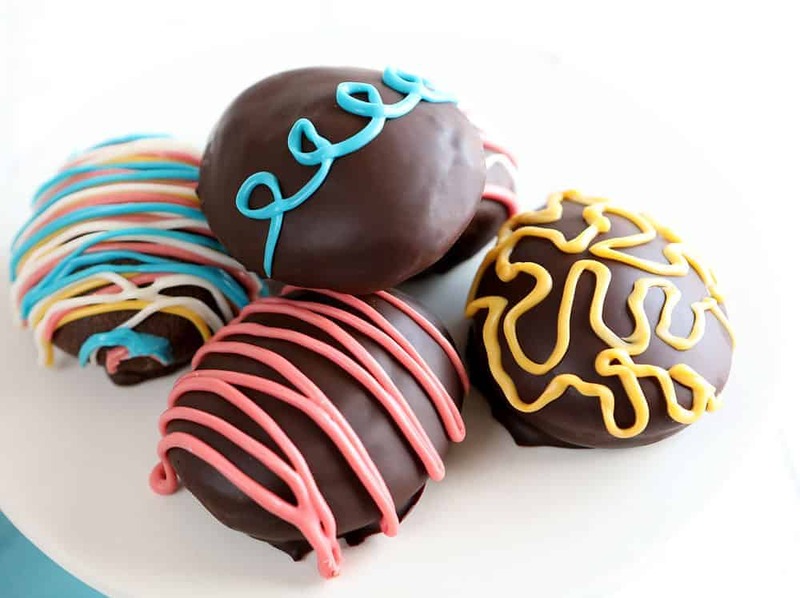 If you want to add sprinkles to the marshmallow eggs, do so while the dark chocolate coating is still wet. It will harden and the sprinkles will all stay in place. 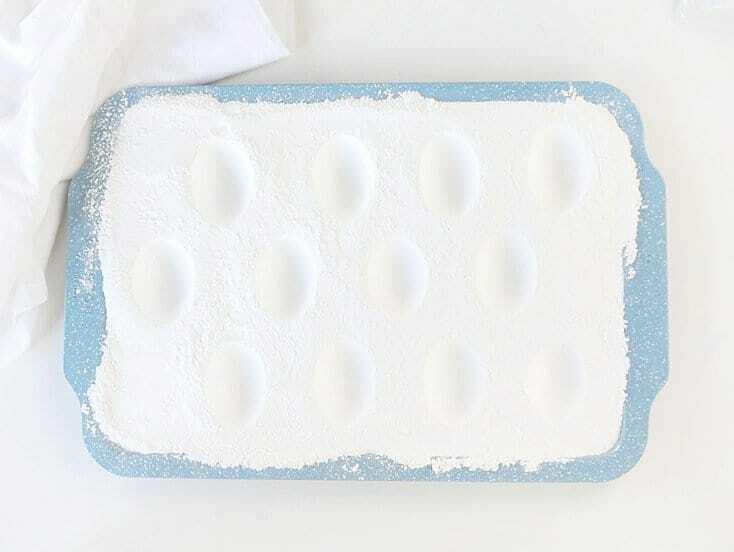 Prepare baking sheets with confectioners sugar. 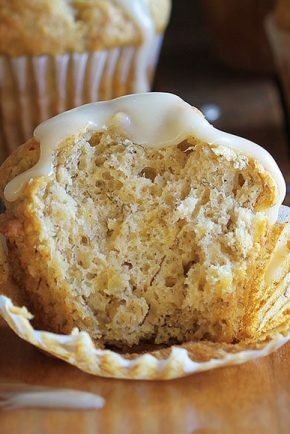 Use an egg to press an egg indentation into the confectioners sugar. Set aside. Add 1/2 cup water and gelatin to bowl of stand mixer fitted with whisk attachment. Allow it to bloom. In a medium saucepan over medium heat, add granulated sugar, corn syrup, and 1/2 cup water. Stir until sugar dissolves then remove your spoon and do not stir again. Add a candy thermometer and allow the sugar to heat to 240°F. Remove sugar mixture from heat and carefully pour into bowl of the stand mixture that has gelatin in it. Turn mixer on high and whisk for about 10 minutes. Remove bowl from stand mixer and pour marshmallow into pastry bags. Pipe marshmallow into the egg molds. Allow marshmallows to set for 1-2 hours. Chop chocolate and melt for 1 minute. Stir chocolate and melt more (15-second increments) if needed. 10. Pick up a marshmallow and dust off excess confectioners sugar. Drop into melted chocolate and coat completely. 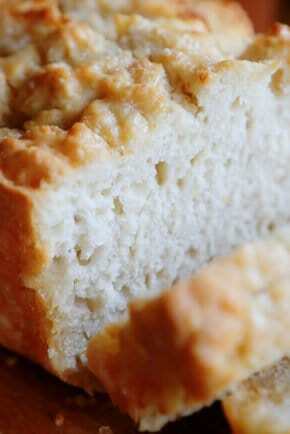 Remove and place on a parchment-lined baking sheet. Repeat with all marshmallow eggs. 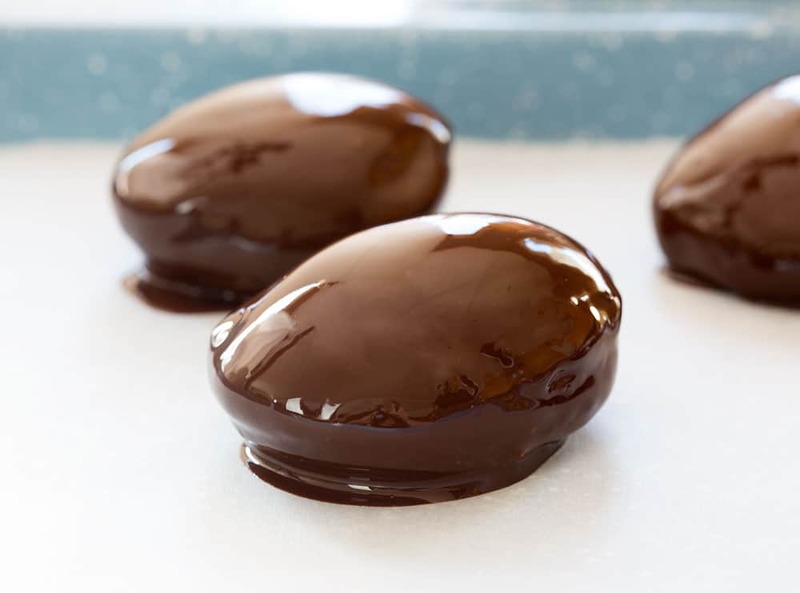 Heat candy melts and pipe onto hardened chocolate covered marshmallow eggs. Marshmallows eggs will be fine at room temperature for 24 hours or in the refrigerator for up to a week. Thank you so much for supporting the brands that support me here at iambaker. I could not have made these delicious Homemade Marshmallow Eggs without inspiration from their amazing products! You can find them here: ALDI, Facebook, Pinterest, Instagram. 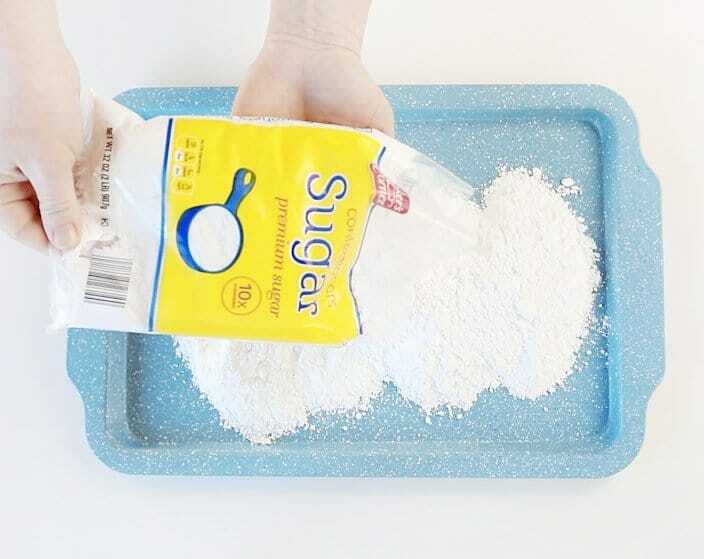 Have you ever thought of using cornstarch as your mild maker instead of the powdered sugar? I’ve seen small mom amd pop candy makers use them. Can you use this same recipe and just put it in a pan and cut square marshmallows? My fave thing at easter is coconut cake! 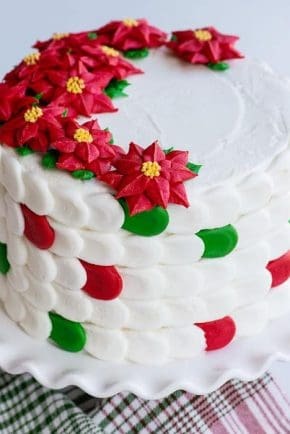 HumMIngbird cake with cream cheese frosting.my families ver favorite. My favorite thing to bake at easter are novelties of some kind. I made brownie bunny butts last easter and am going to make peanut butter fudge bunnies this year. 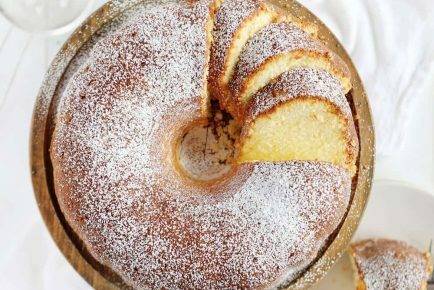 Could you add vanilla extract to the recipe? even almond extract at the end? 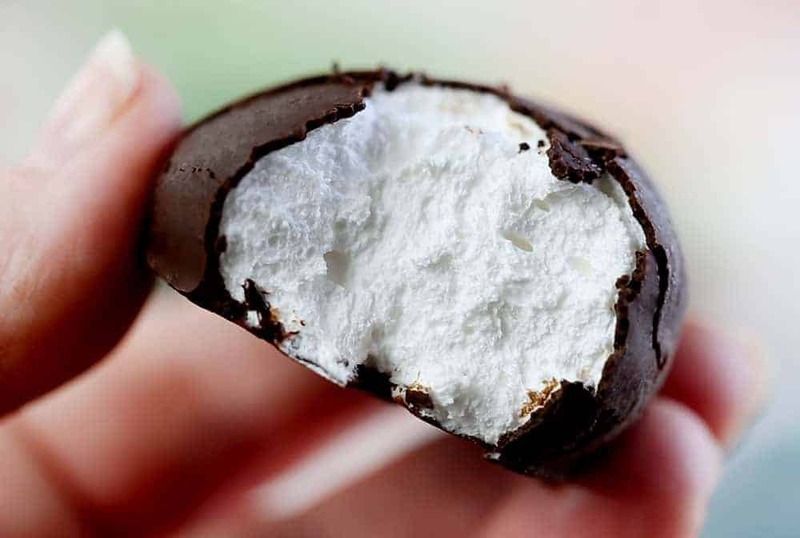 My favorite thing growing up were chocolate covered mint marshmallows from a small candy store. They stopped making them years ago much to my dismay but now I can make them myself by adding mint extract to this recipe! 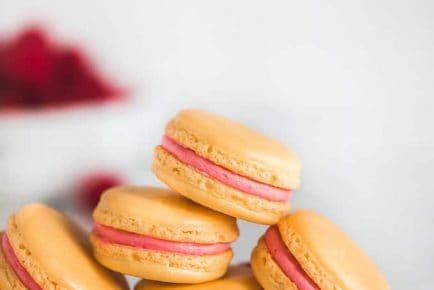 Beautiful Recipe and one i will now try. I went to Aldi yesterday and bought some of those cute and colorful pans. Thanks for the new recipe. Have you only made half of the recipe? if so does it work? I have not made half of the recipe. Would marshm fluff work instead of mak your own marsh? Could you use deviled egg plates as your egg mold? Thank you for this recipe – and for all of the tips based on your experience. I love marshmallow ANYTHING, but marshmallow Easter eggs are extra special. They always remind me of when I was little and these eggs would “magically” appear in my basket on Easter morning. Blessings, sister! !